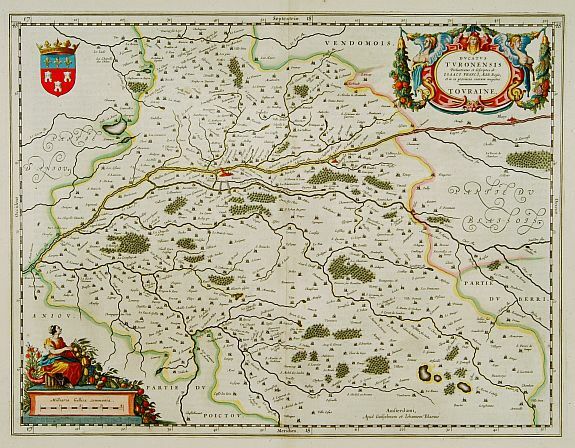 BLAEU - Ducatus Turonensis.. Touraine. BLAEU,W. - Ducatus Turonensis.. Touraine. Ducatus Turonensis.. Touraine. - BLAEU,W. Title : Ducatus Turonensis.. Touraine.. Size : 15.0 x 19.4 inches. / 38.0 x 49.2 cm. Description :A very decorative map with beautiful cartouches of a province of France by one of the most famous map publishers. Including the River Loire Valley with the towns of Tours, Blois, Amboise, etc. All the important castles are marked.